Natural perfumer Mandy Aftel has described the bitter orange tree as a “veritable cottage industry for the perfumer,” because its parts can be used in so many different ways. The peels of the oranges yield orange oil; the tree’s twigs and leaves give us petitgrain; and the blossoms are processed to create both neroli absolute and orange flower absolute. 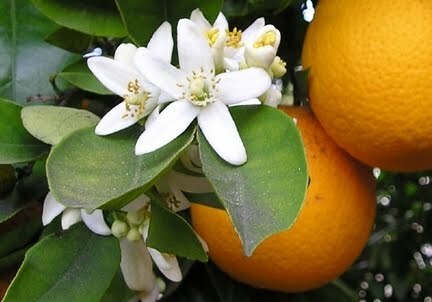 Neroli absolute is produced when orange flowers are distilled with water. It was reportedly named in honor of a princess of Nerola, Italy, who set a trend in the seventeenth century by using this essence to scent her gloves, her bathwater, and so on. Neroli has a slightly citrus-fruity scent, but more than anything, it’s like liquid sunshine. If it were a color, it would certainly be golden. Orange flower absolute is extracted by processing the blossoms with solvents rather than distilling them with water or steam. Even though it comes from the same plant, orange flower essence ends up smelling noticeably different from neroli. It’s still fresh and bright, but definitely more flowery. Sometimes it has a faint hint of creaminess. It’s just a little bit sensual, but in an upbeat, approachable way; it’s never overwhelming in the way that other white florals (like tuberose or even jasmine) can be. Disclosure: The perfumes mentioned in this post were purchased (or sampled in stores) by the reviewer. Quotation: Mandy Aftel, “Essence and Alchemy,” page 114. 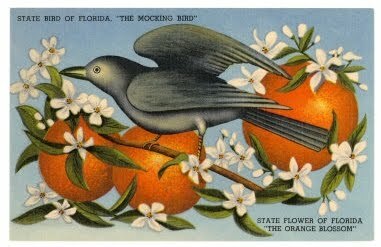 Photo Credits: Mockingbird and Orange Blossoms, via Art.com. Orange blossom and oranges, via Wikimedia Commons. I thought about you guys this weekend -- the Wall Street Journal's style section had a piece on orange fragrances. Just wanted to thank you for continuing the tradition and doing this series. 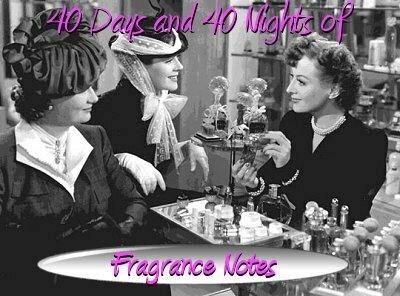 I'm really enjoying it, and coming up with a list of new perfumes to try. Hi, Faye -- I saw that article, too, and I'd already sent mine out to Annie -- oh well! But it really is the perfect spring fragrance note. Beautiful review and info on the lovely orange blossom, Jessica! And I was surprised to see how many perfumes I love which have neroli! Thank you! Patti, I think I prefer neroli to orange blossom, too. It just feels a little warmer to me. Mandy, thank you for your kind comment! It's a pleasure to "see" you here. I think most of us are on Twitter now... I tweet as @lipstickrose, Annie is @annieytown, Patti is @caveypatti, and Ceil is @tussah1. Hello! Just wondering how long the Pacifica lasts - thanks!